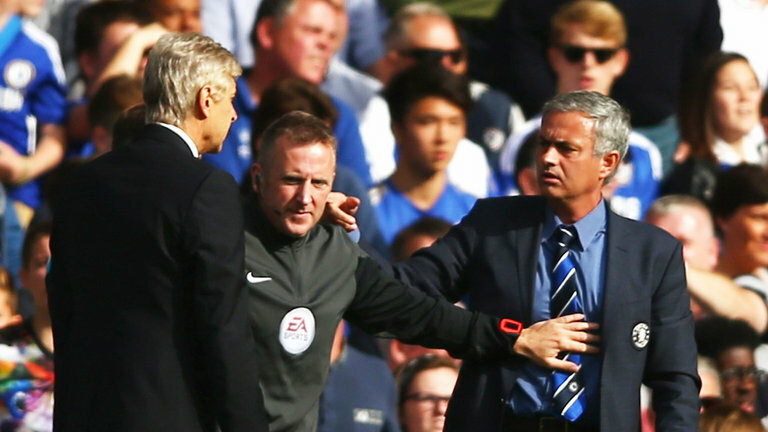 This past weekend's Community Shield saw yet another chapter in the long running feud between Chelsea boss Jose Mourinho and his Arsenal counterpart Arsene Wenger. Following Arsenal's 1-0 victory over Chelsea in the traditional English season opener at Wembley Stadium, the two managers made absolutely no effort to shake hands with each other after the match, as they both stormed off without a glance at their respective enemy. The approach both managers have to their jobs is in stark contrast. While Wenger tries to set his sides out to play football a certain way, and can be very pleasing on the eye when everything is working out as he planned, Mourinho is all about results no matter how they're achieved and his sides can even adopted the 'darker arts' if necessary. It also doesn't help that Mourinho is motivated by feuds with rival managers and has started numerous fights over the years with the likes of Pep Guardiola, Tito Vilanova, and Rafa Benitez to go along with his long running beef with Wenger. "You know, boring I think is 10 years without a title. That's very boring. You support the club and you're waiting, waiting, waiting for so many years without a Premier League title, so that's very boring. But maybe they aren't singing to us." "If you add up the amounts clubs have spent in the last three or four years I think maybe you will find a surprise. If you put Ozil plus Alexis Sanchez, plus Chambers, plus Debuchy, you will find a surprise. Get a calculator. That is the easiest thing, it leaves no space for speculation. If you want to be honest, objective and pragmatic it is the easiest job for a manager to do."